Rice grain with excessive cadmium (Cd) is a serious threat to health for people who consume rice as a staple food. However, the development of elite rice cultivars with consistently low Cd content is challenging for conventional breeding approaches. Hunan Hybrid Rice Research Center researchers reported the development of new indica rice lines with low Cd accumulation and no transgenes. The team knocked-out the metal transporter gene OsNramp5 using the CRISPR-Cas9 system. Analysis of the new indica lines showed that Cd concentrations in shoots and roots of the developed mutants were greatly decreased. 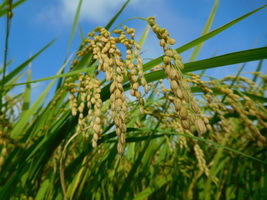 Furthermore, Cd-contaminated paddy field trials also showed that Cd concentration in the grains of the CRISPR-developed lines was consistently less than 0.05 mg/kg. The plant yield was also not significantly affected in the developed mutants. This study presents a practical approach to developing low cadmium indica rice cultivars that minimizes contamination risk in grains. For more information, read the article in Scientific Reports.